Last time I spent a lot of time on a learning F# language. My mentor, Andrés G. Aragoneses, proposed me to write my task in this language (at the beginning it was to be a C# ). I'd never written anything using this language, so I started to read everything what I noticed in the internet about it. The most interesting articles I can be found at the end of post. Because I even after reading a lot of articles I wasn't so experienced in F# (I'm still not ;), I started to write in C#, and then I rewrote my code to F#. After that, I improved it a little, by finding real album's name in MusicBrainz  service. 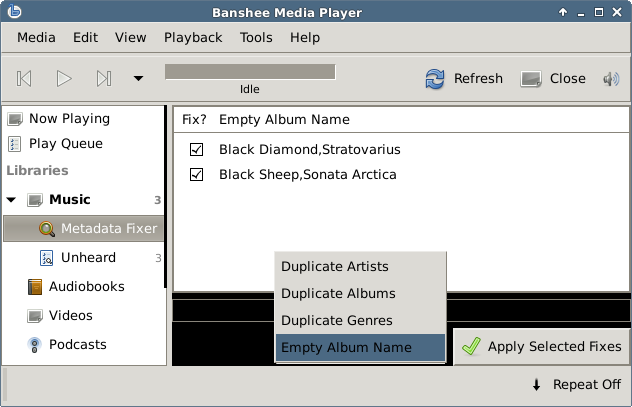 Meanwhile I fixed bug , which totally prevented to use Metadata Fixer in the newest Banshee version. Now I'm trying to use AcoustID  - it's an Open Source project, which allows to read fingerprints from audiofile. Fingerprint may be used for finding more informations about track (e.g. track name, artist, release etc.). For now, I wrote an application, which takes audiofile as an argument, reads fingerprints, and display some informations about this file. Fingerprints are calculated from decoded stream, so we can use this application for every audio format, which is supported by GStreamer installed on your system.